Are you constantly irritated by static electricity in your home? That is a sure sign your humidity is too low. Research has shown that dry air can be very damaging to your health, causing respiratory problems, general dehydration, dry, irritated skin and itchy eyes. When leaving a large pot of water to evaporate on the windowsill just won’t do, call the experts at Parent Heating & Cooling at 613-739-4515. We have the solution! Byrant has focused on the control, filtering and refreshing of your indoor air with their line up of humidifiers. 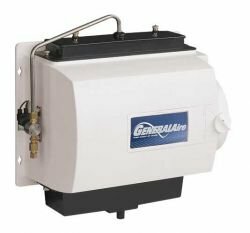 Reduce the dry, stuffy air that can degrade the efficiency and effectiveness of your heating system, while eliminating conditions that increase the possibility of catching cold and flu viruses. 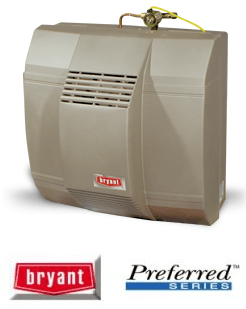 Enjoy the comfort and peace of mind that comes with all Brant humidifiers. 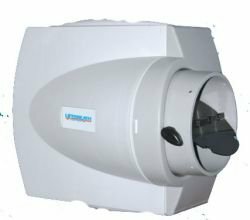 Built with top quality parts since 1904, Brant backs all humidifiers with a limited 5 year warranty on electrical and 1 year limited warranty on the entire unit. 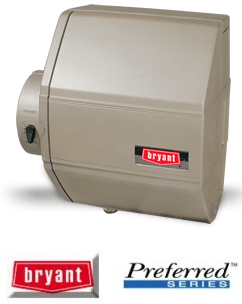 Bryant’s Preferred Bypass Humidifier works as a value-add to your heating system, relying on the furnace blower to deliver moisture vapor throughout your home. Low-noise operation and reduced static add to whole-home comfort. Elegant Styling designed to deliver “PURE STERILE STEAM” to maximize indoor air quality. LCD Display with numerical and icon menu, constant monitoring and diagnostics. Flow-through humidifier that’s ideal for most homes. 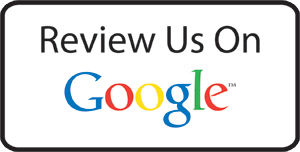 Installs on vertical warm air supply or cold air return plenum. This unique electronically pulsed flow-thru humidifier reduces water consumption by up to 80%. The electronic controller pulses the solenoid water supply valve for a period of 4 seconds ON and 30 seconds OFF. This allows the evaporator pad to be fully saturated while drastically limiting the water wasted through the drain. This unique approach greatly improves the unit performance by allowing a higher average temperature on the evaporator pad, and makes the Pulsed Flow-Thru the most environmentally friendly unit.